Suncoast Roofing Solutions is a professional roofing company with more than 40 years of experience in the field. Founded and operated by owner, Doug Ford, Suncoast Roofing Solutions offers commercial and residential roofing services throughout the Tampa and South Tampa area, including Hillsborough County, Pasco County, and Pinellas County. “Wherever your home or business is located, we’re ready to put our 40-year experience to work for you,” says Doug. 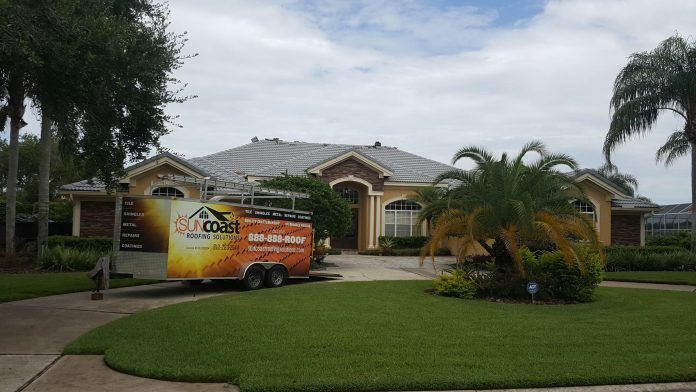 By maintaining ongoing contracts with a hand-selected team of builders, Suncoast Roofing Solutions is ready to provide unique roofing solutions for every individual client. Whether you’re looking for a small-scale residential repair or a large commercial roof replacement, rest assured that the professionals at Suncoast Roofing Solutions will work with the highest efficiency, and provide you with the most ethical service at competitive prices. Suncoast Roofing main area of expertise is installing and repairing tile roofs. Clay and concrete tiles are among the oldest roofing materials known to man. Modern roofing tiles are much more technologically advanced than their ancestors hundreds of years ago. With Suncoast Roofing you can choose from a vast selection of designs, colors, and high-performance finishes. Many small businesses in Tampa have tile roofing. Tile roofing looks great, lasts a long time, and in many areas the managing association code requires it. Although tile lasts a long time, it does require the same maintenance and repair that any other commercial building’s roof needs. When you choose a company who specializes in commercial tile repair, your roof will be repaired properly. Tiles are environmentally friendly. They are made from natural materials and are fully recyclable at the end of their lifespan. Natural tiles can last up to a hundred years when they are properly installed and cared for. Tiles will not rot in moist climates, making them ideal for Central Florida and the Tampa Bay Area. Clay and concrete roof tiles are highly energy efficient. They create a ventilated space within the roof itself, insulating the building and lowering the cost of air conditioning. IF repairs are necessary, Suncoast Roofing contractors are always available to restore or replace your roof tiles. Whether you’re a business owner or a homeowner, when you work with Suncoast Roofing Solutions, you are guaranteed to get the highest level of personalized service. “We maintain two separate roofing divisions,” says Doug. “A commercial division and a residential division. This helps us meet the different requirements of different customers. Both divisions are made up of hand-picked specialists who know exactly how to work with each kind of property.” Suncoast also employes green roofing consultants who are ready to help you cut energy costs in your home or business. Contact Suncoast Roofing Solutions today by calling (813) 283-2544. Log on to www.suncoastroofingsolutions.com for more information.